Phillip Noyce adapted Doris Pilkington's novel for the screen. These young girls travelled from Moore River to the Rabbit Proof Fence and followed it all the way to Jigalong, a distance of around 1500 km. The Moore River Native Settlement was 11 km West of Mogumber, a small town 135km north of Perth on the Moore River. It ceased operation as a mission in the 1970s and the facility is now known as Budjarra. Onkaparinga River Recreation Area and National Park is where the Moore River Native Settlement set was recreated for the filming of Rabbit Proof Fence. According to Open House Perth, "A number of historically prominent figures were accommodated at 57 Murray St including ... Chief Protector of Aborigines AO Neville" (see: http://www.openhouseperth.net/destination/34-57-murray-street ). The girls follow the rabbit proof fence north through the desolate desert landscape of Western Australia. The location given here is Nannine, near Meekatharra on the way to Jigalong. Many of the scenes in which the girls follow the rabbit proof fence through red sand dunes and rocky desert landscapes were filmed on private property at Nilpena Station, South Australia. The girls follow the rabbit proof fence home to Jigalong, which was a vermin barrier running through Western Australia. The location given here is Rabbit Proof Fence Rd in Dalwallinu, which is plausibly near where the girls would have first intersected with the fence after they escaped. 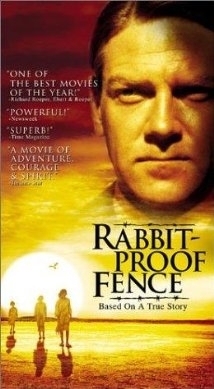 The scene when the girls first find the rabbit proof fence after escaping Moore River are shot on private property at Beltana Station, according to Anthony Roberts in Reel Locations (2011: 206). Gracie is recaptured at Wiluna as she tries to catch a train to find her mother.